It's time for Congress to enter into a serious discussion about reforming the federal Endangered Species Act. While it is well-intentioned, it has met with limited success in achieving its goal of protecting major species on the verge of extinction, and its other major shortcomings cannot be overlooked. They fall in four areas: cost, ineffectiveness, property rights and misuse. The cost of the ESA is monumental. Billions of tax dollars have been spent in efforts to revitalize and reintroduce major and minor species. In five years alone the federal government spent more than $1.1 billion on endangered and threatened salmon that spawn in the Columbia and Snake rivers. That doesn't include the amount the federal government spent before that and will spend in years to come. Currently, the U.S. Fish and Wildlife Service lists 71 clams, 60 insects and 29 ferns as endangered or threatened. In total, 584 animals and 795 plants are listed in the U.S. These facts would likely surprise many members of Congress who in 1973 passed the ESA hoping to bolster efforts to recover the bald eagle and other major species. That 36 snails would join the nation's symbol on that list could not have been foreseen. Property rights are another major ESA issue for farmers and ranchers. As buffer zones are considered to prevent some pesticides from reaching salmon-bearing streams, farmers give up the use of that land, yet are not fully compensated. William Ruckelshaus, twice administrator of the Environmental Protection Agency, said in an interview with the Capital Press that farmers should be indemnified for the loss of their land. "If I'm forced to put buffers alongside streams that run through my land in order to protect salmon, sometimes those buffers take a significant amount of my land." he said. "And I think they should be compensated for that." The ESA is misused two ways. Environmental groups file a blizzard of lawsuits against the federal government over technicalities in the law as a way to tap federal funds. The Equal Access to Justice Act provides them with payments when they point out where federal managers have slipped up. 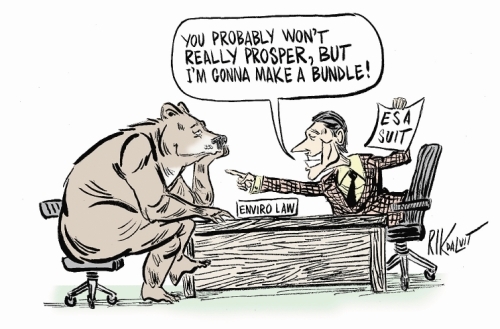 Environmental groups also use the ESA to stop, and potentially reverse, any development they oppose. Dating back to the snail darter case in 1975, development has been subjected to the whim of where flora and fauna occur. The question arises: What can be done to improve the ESA? One area that should be considered is the species that can be listed. If a major animal or plant is facing extinction, that would certainly warrant designation as endangered. But if it no longer lives in one area but is plentiful elsewhere, does that really make it endangered? Sixteen "species" listed as endangered are actually local populations of single species. Similarly, if a lichen becomes rare, what resources should the federal government invest in "saving" it? And should there be a monetary limit? Compensating those people who lose the use of their property is another area. Individuals should not have to bear the burden of protecting a species. Finally, the access to justice law should be modified to prevent groups from using it like a money tree. Payouts in ESA-related cases should be limited in dollar amount and in number. The ESA is fundamentally broken. Congress must fix it. When it comes to legislation that helps our environment and protects our interests without wasting taxpayers' dollars, we can do much better.